Yes, track uploads are now available on the platform! 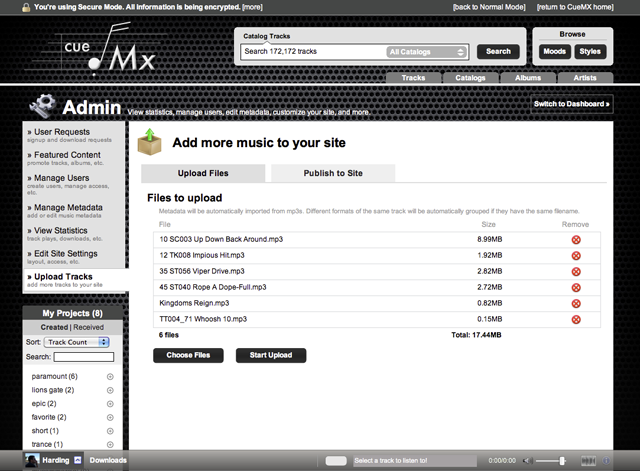 Whether you just need to upload a single track or 20 full albums all at once, this new tool has you covered. We can handle as many songs as you want to give us in one simple step-by-step operation. First, we'll give you some quick highlights and then we'll show you exactly how it works. Upload one song or as many songs as you want all at once. Upload multiple formats for each song or ask SourceAudio to automatically create mp3's, AIFF's or WAV's for you - with no additional work for you to do. Watch SourceAudio's smart upload tool read the embedded metadata in each file (whenever present) and intelligently fill in the track information on the site for you. 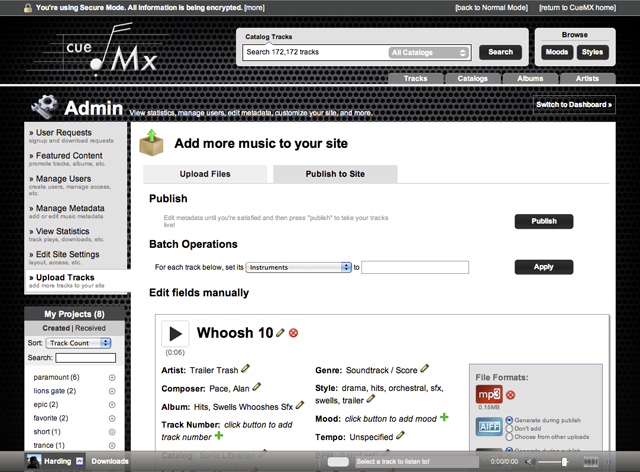 Use our batch operations tool at the end of the upload process to edit the metadata on each individual song or for all songs at once before you make them live on your site. This is great if you know you want all songs to belong to one album or a specific label - you tell us to update the whole list and it's done in one simple command. 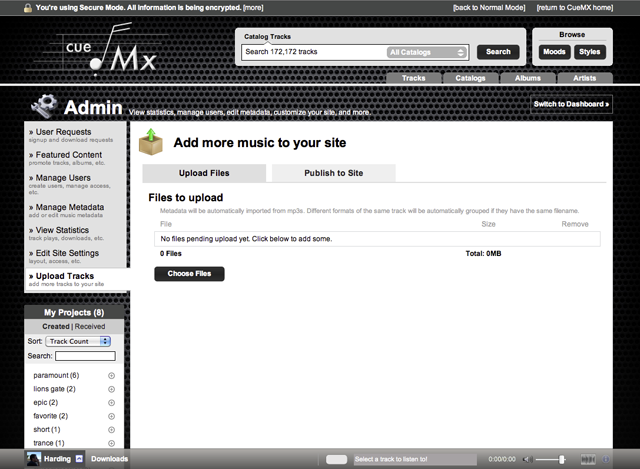 Preview track playback and make sure all your metadata is tightened up before you publish it to the site. Once you publish, we create the waveforms and your new tracks are up and available on your site. 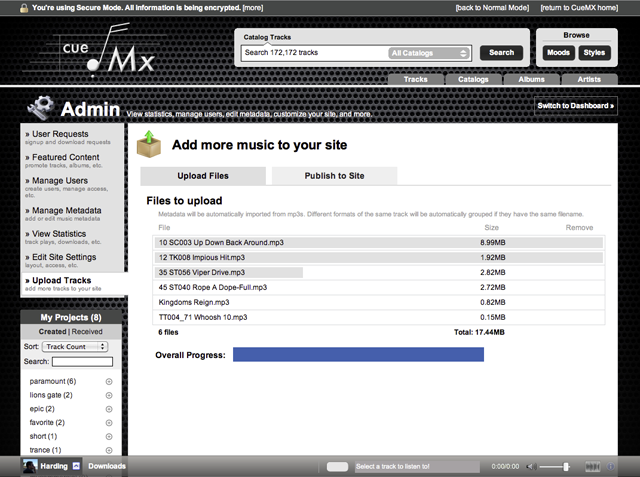 Here's what you'll see when you get to the new Upload Tracks section. Use your keyboard commands (hold down shift) to select a full list of songs to upload. Or you can go one track at a time - it's up to you. 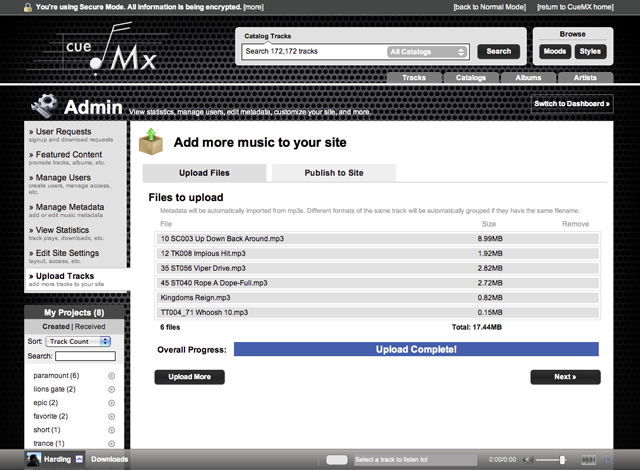 You can also add more tracks to this upload batch or remove individual tracks in this step before you proceed. We'll show you the progress for individual tracks as well as the overall batch progress as a whole. Be patient, we'll tell you when it's done! We'll tell you when your upload is complete. Just watch your overall progress bar at the bottom for the notification. Click "Next" when it's ready. » Step 6 (Final Step): Edit metadata on one or more tracks at a time, attach alternate file formats to your tracks - or tell SourceAudio to auto-generate them for you - and then publish your tracks to your live site! Use the batch operations tool to update the metadata on all of your new tracks or update each song individually inline below. 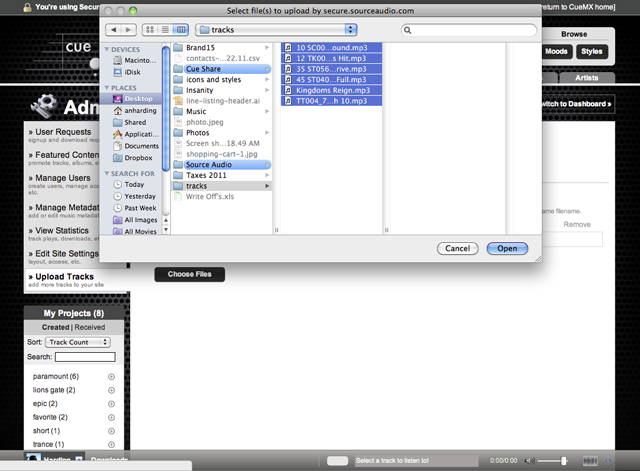 Also, tell SourceAudio to auto-create alternate file formats for each of your tracks or upload your own. When you're done just hit "Publish" and your new tracks are live! Now go give it a shot, it's super easy to use, extremely powerful, and will make your life of managing tracks, versions, metadata, and search & distribution a whole lot easier!